Two weeks ago, fresh off of the disappointment of not running my first ultra marathon at the North Face Endurance Challenge 50k, I signed up for the Atlanta Marathon. It, like the 50k would have been, was a spur-of-the-moment race choice. Due to a few reasons, I have been struggling to get a solid base of training in lately. But I dove in head first. Practicality be damned. Nice logo, right? I just wish it had been on the shirt. The past two months of running have been spotty. I’ve wavered between 45 miles per week to about 5. And my long runs, well, the last 20 mile run I did was on July 23, three months before the race. I knew I was in decent shape, but how I would do over 26.2 miles was a bit of a mystery. With all of this on my mind, I went into the Atlanta Marathon on Oct. 30 hoping to break 4 hours. I hoped I could finish in about 3:50, and thought that maybe, just maybe, I could cross the line around 3:45. When I said it out loud it sounded almost boastful to think I could do that with such shoddy training, but then again, in 2005 I decided I’d pack up my bike and ride 70 miles a day for a month with basically no training beforehand. I mean on my first day I rode 86 miles through hilly Kentucky until both of my hamstrings, quads, and calves all cramped up at the same time and I had to goose-step into a motel and pass out. But I digress. I’m stubborn and when I get an idea in my mind it’s hard to move it. So there I was, planning to break 4 hours if I had to run myself into the ground. Of course, the marathon was on Sunday, October 30, and Sara and I had already planned to go out Saturday night to celebrate Halloween (why miss an excuse to dress up as the cast of Seinfeld and drink?). We ended up going to the High Museum of Art to see some DJ. I dressed as a pretty crappy Newman (entirely my fault). At about 12 I figured it might be time to think about going home. I ended up getting about 3.5-4 hours of fitful sleep. I was apparently too nervous and excited to sleep well. 5 a.m. came quickly. I drank a few cups of coffee, threw on my running clothes, and headed out to the car to drive over to Atlantic Station. 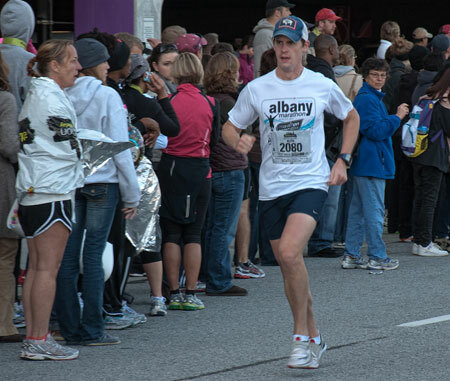 I wore my regular running shorts, some cheap fleece gloves, my Albany Marathon shirt (people along the course called me Albany a bunch), and some arm warmers. I was freezing at the start line, but eventually I got used to it. Feeling pretty good around mile 6. I expected a starter’s pistol to go off, but right around 7 a.m. the pack of people in front of me just started running. With a field of only ~1,300 marathon runners, it was nice to not be too crowded for the first couple of miles. As we ran down 20th street and took the right onto 16th, I knew I felt good. I wasn’t nervous or even too excited to be honest, I felt like I was just out on an easy run. Miles 1 through 6 were pretty uneventful. Around mile 6 the course took us down Capitol Ave under the Olympic rings and toward Turner Field. 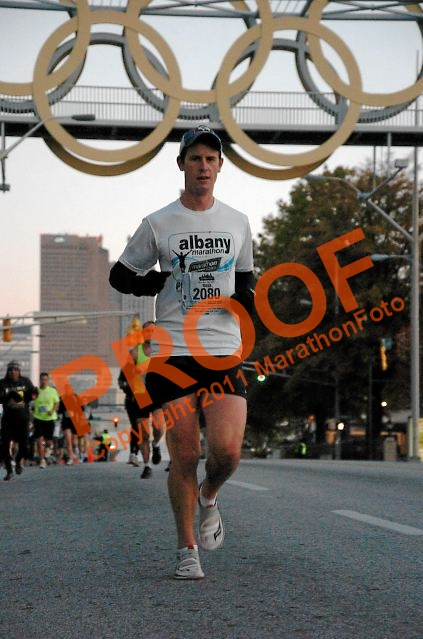 Back in 2008 my first half marathon, the Atlanta Half Marathon, had its finish line there. I remembered how awful I felt nearing the end of that race and how unprepared I’d been. What a difference a few years makes. My mile splits up to the 6th mile were 8:43, 8:31, 8:13, 8:13, 8:16, 8:07. I was feeling better and better. The next three miles were all right at 8 minute miles. I felt pretty good. In fact, as I passed some of the cheering groups, I started to feel amazing. I was high fiving people as I ran by, closed my eyes and listened to the bagpipers along the road, and really really enjoyed the first half of the race. Still feeling good as the race turned down Virginia Ave, I started to get a tiny bit worried. Did I feel too good? Was I digging myself a hole for later on? All I could do was keep my pace in check and just keep on running. Somewhere around mile 18 the short but steeper hills began. I knew it had been too flat early on, so I wasn’t surprised. I’d also been running through the area enough to know what to expect. It hurt some though. I felt the lack of training for the next few miles more than I did at any other time in the race. I also started to worry more. “You can’t cheat the distance,” I’d read before. A few people had doubted my ability to go sub 4 hours due to my lackluster training, and their voices ran through my head. Was I going to hit the wall? Just keep running, I thought. If I hit the wall all I’m going to do is keep moving my legs until they won’t go anymore. The doubting gave way to simple pain when I turned left onto Peachtree Road. I’ve never run the Peaachtree Road Race before, but I heard others saying that we met up with Peachtree at just the right spot to run up Heartbreak Hill. At that point I knew I was 3 miles away from the finish line, and nothing short of my legs falling off was going to stop me, painful or not. I stayed on pace on a couple of side streets, and finally 17th street was right ahead. My legs had been twinging for the last few miles, but all I could do was keep going. I’d stretch them later, or so I thought. About a quarter mile or so from the finish line my legs cramped up for good. I’d had a decent amount of energy gels and water through the race but apparently had needed more salt. I ended up sitting down on 17th street, just minutes away from the finish line and stretching. I was sure a 3:45 marathon had slipped away from me. I got up and started running again. Nope. More hamstring cramps, more quad cramps. More stretching. I finally got up and started hobbling. It turned into a jog and finally I was back on pace. There wasn’t any more twinging, so I started sprinting (as well as I could after 26 miles). I heard my parents yelling my name but couldn’t turn to look. I could see the clock at the line and knew I was cutting it close to go under 3:45. I thought about the disappointment I felt when I ran my 40:02 10k in June, and I pushed as hard as I could. I crossed the finish line in 3:45:03 clock time, but my chip time was 3:44:39. I was under 3:45 and had surprised myself. I was 17th in my age division (awesome!) and 164 overall. Post race massage, needing a beer. Good job and congrats, again. And nice race report! Thanks! I should have written this earlier, some details have already faded in my head.